San Francisco, CA — San Francisco based NaturEner USA, LLC, and its subsidiary NaturEner Energy Canada, Inc, announced today that CEO and President José Maria Sánchez Seara has resigned effective immediately from his current positions; however, he will remain with the companies through the end of the year to ensure a successful and seamless transition to NaturEner USA’s new CEO, Walter Kamp and NaturEner USA’s new President, Jim Kutey. Sánchez Seara formed NaturEner USA LLC and NaturEner Energy Canada Inc. in 2006, as wholly owned subsidiaries of Grupo NaturEner SA. Under his leadership, NaturEner has developed and operated three wind farms in Montana, (making NaturEner the largest wind producer in the state), created and secured certification for two NERC certified Balancing Authorities and has taken the Wild Rose 1 and Wild Rose 2 wind farms in Alberta, Canada, to an advanced stage of development with recently approved permits from the Alberta Utilities Commission. He leaves NaturEner USA well-positioned to capitalize on substantial near-term growth opportunities. NaturEner USA named Walter Kamp as its new CEO and Jim Kutey as its new President. Both Kamp and Kutey currently serve as the CEO (Kamp) and Chief Development Officer (Kutey) for another Morgan Stanley owned wind energy subsidiary, Third Planet Windpower, LLC (TPW). Walter Kamp, the incoming NaturEner CEO brings 30+ years of energy industry experience to the Company, with 17 of those years specializing in the Wind Energy industry. Walt has been the CEO of Third Planet Windpower, LLC (TPW) for the last 7 years, and will retain his position and leadership role there going forward. As CEO, he has a successful track record of leading a merchant wind platform with a focus on profitability and asset optimization. Additionally, Walt has an extensive background in wind energy project development, engineering and construction, and operations from his time at TPW and FPL Energy. By education, Walt has an engineering degree from the University of Miami and an MBA specializing in entrepreneurship. Jim Kutey, a senior executive and incoming NaturEner President, brings over 30 years of energy industry experience to NaturEner with 16 years of direct wind industry experience. His Third Planet Windpower and FPL Energy experience includes business strategy, project development, asset management, and O&M optimization. As TPW’s Chief Development Officer for 7 years, he cultivated the technical and commercial development of its operating portfolio. Jim’s early career experience includes nuclear engineering and operations, with R&D activities, for General Electric and Lockheed Martin supporting the US Navy’s submarine program. Jim holds engineering degrees from Rensselaer Polytechnic Institute (RPI) and an MBA from RPI’s Lally School of Management. “Jose Maria has worked tirelessly to create and nurture this company. His diligence and hard work have led to many successes, I think I can speak for all of the NaturEner employees when I say that his tremendous presence will be missed.” Walter Kamp, NaturEner CEO said. Sánchez Seara, Kamp, and Kutey will work together throughout the remainder of 2017 to ensure a seamless transition. NaturEner USA and NaturEner Canada develop and operate utility-scale renewable projects in North America. Using advanced renewable integration solutions and leveraging ownership of strategic transmission positions, we unlock and optimize renewable generation. 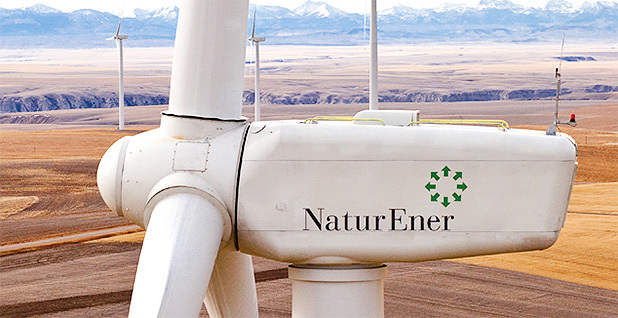 NaturEner owns and operates three wind farms in Montana (Rim Rock, Glacier Wind 1 and Glacier Wind 2), two NERC certified Balancing Authorities (Wind Watch and Power Watch), and the Canadian based Wild Rose 1 and Wild Rose 2 projects. NaturEner began in 2006 when José Maria Sánchez Seara, a wind executive from Madrid, set up shop in a hotel room near San Francisco’s Union Square with nothing more than a laptop. It now has 75 employees, most of whom work in a handsome brick building in the Financial District, with 20 at the company’s three U.S. wind farms. Their collective capacity of 399 megawatts is by far the largest fleet in the windswept state of Montana. NaturEner also has rights to a transmission line across the border to the Canadian province of Alberta, where it is developing another 600 MW of wind projects. Its San Francisco office is sheathed in security. Past its locked door, an unsmiling man at the front desk ensures that every line in the entry book is in order before issuing a badge. Sánchez Seara fetches a visitor past a partition and into the office, where everyone seems too intent on their work to notice a newcomer. Along one wall is a thick, locked door, behind which sit the computer servers. Next to it is a control room, also locked, where three technicians watch a wall-size bank of screens. This control room was completed last year with nearly identical technology to that found in the control room of the California Independent System Operator, one of the most sophisticated grid control rooms in the world, Sánchez Seara said. The largest image on the screen is a map of a wind farm. Each turbine is represented by a purple arrow, which lengthens or shortens, and oscillates side to side, depending on the direction and strength of the wind. All of the arrows are long. A screen on the right tracks the farm’s output with a black line, which scrapes near the top of the chart. Both Avangrid and NaturEner say that there’s one main reason it makes sense for them to turn wind power into firm power: They are located in the Pacific Northwest, one of the most Balkanized areas on the continent when it comes to sharing electricity. Most of the country is served by a central system operator, such as California’s ISO, the Midwest Independent System Operator or the PJM Interconnection, which coordinates a huge swath of the Mid-Atlantic region. They are blenders, taking inputs from a constellation of generators and dispatching them to users. In the Pacific Northwest, to borrow a phrase, every man blends for himself. The other option is to turn to the BPA, which is the largest balancing authority in the region but comes at a cost. Beane explained that the BPA initially had a difficult time handling the steady growth of wind power along the Columbia River. The winds blow upriver, meaning that when one wind farm is producing, they all are, creating massive spikes and troughs on BPA’s system. BPA responded by imposing a charge on wind operators, pegged not to how much wind they produced at any given time, but to the overall capacity to produce. Those charges were so costly that it motivated Avangrid to acquire its natural gas plants, and in part motivated NaturEner to stand up its own balancing authorities so it could exist outside of BPA’s boundaries. But it is a microcosm for what those larger system operators have claimed, in response to the Trump administration’s criticism that intermittent renewable energy undermines baseload. They have said that renewables, even a lot of them, can be reliable as long as they are carefully coordinated, like in the control rooms of NaturEner and Avangrid.